Anonymous artist, L’Amour et la musique, 1860. 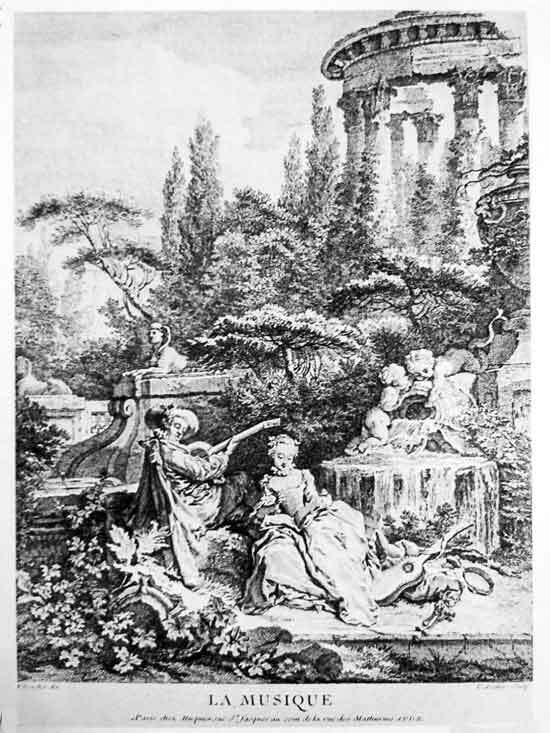 As will be discussed below, a curious engraving appeared in the April 1860 issue of L’Artiste, a magazine that was a leading exponent of the rococo revival. It is printed in red and black ink, thereby seeming to imitate a chalk drawing, but the more likely source was the painting A Couple Making Music. 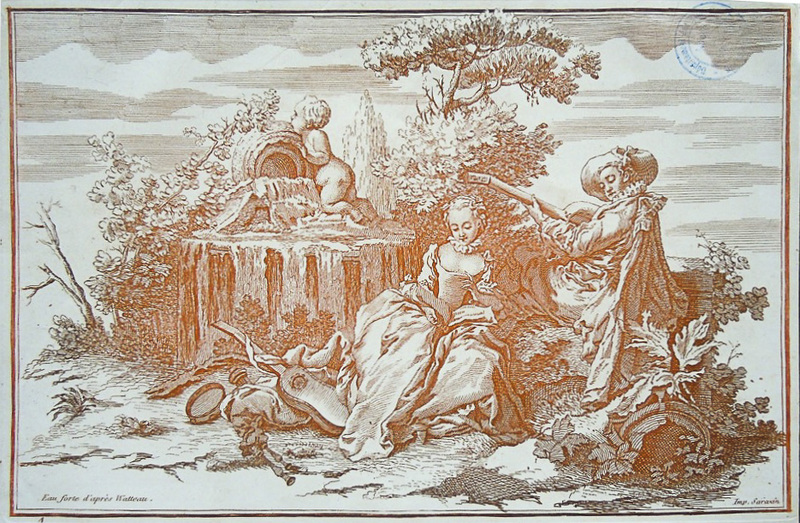 The print is the reverse of our composition, omits most of the painting’s extensive park setting, has repositioned the small still life of musical instruments, and omitted one of the two sculpted putti on the fountain. Inscribed in the lower left corner of the print is the declaration “Eau forte d’après Watteau,” which gives us an indication of how the painting was classified at that time. Paris, c. 1860. The engraving discussed above suggests that the painting was in the French capital or its environs at that time. New Orleans, Neal Auction Company, February 23, 2008, lot 594: “In the Manner of Jean-Baptiste-François-Joseph Pater . . . ‘A Music Making Couple in a Sculpture Park”, probably late 18th/early 19th c., oil on canvas, unsigned, 33 in. x 57½ in., in a modern coved and molded giltwood frame with artist’s plaque. $12000/18000 Provenance: Reverse bears repositioned mid-20th c. typed label, in German, reading (in translation) ‘Property of Ms. Maria Jeritza’ (Czechoslovakian, 1887- New Jersey 1980). Jeritza was a celebrated diva of international opera who made her debut with The Vienna Opera in 1912. She performed with The Metropolitan Opera from 1921 to 1932 and was featured on the November 12, 1928 cover of Time Magazine.” The painting went unsold. New Orleans, Neal Auction Company, February 23, 2008, lot 406: “In the Manner of Jean-Baptiste-François-Joseph Pater . . . ‘A Music Making Couple in a Sculpture Park”, probably late 18th/early 19th c., oil on canvas, unsigned, 33 in. x 57½ in., in a modern coved and molded giltwood frame with artist’s plaque. $6000/9000 Provenance: Reverse bears repositioned mid-20th c. typed label, in German, reading (in translation) ‘Property of Ms. Maria Jeritza’ (Czechoslovakian, 1887- New Jersey 1980). Jeritza was a celebrated diva of international opera who made her debut with The Vienna Opera in 1912. She performed with The Metropolitan Opera from 1921 to 1932 and was featured on the November 12, 1928 cover of Time Magazine.” The painting went unsold. At first glance the whole of the painting might seem relatable to comparable imagery in certain early Watteau compositions such as L’Été from the Saisons Jullienne. Thus one can appreciate how this composition might have been attributed to Watteau in the mid-nineteenth century when scholars and collectors were far less knowledgeable. On the other hand, neither the exaggerated pose of the guitarist nor the proportions of the woman singer, much less the overall composition with its overly profuse landscape and abundance of umbrella pine trees and sphinx statues, find parallels in Watteau’s oeuvre. Pierre Aveline after François Boucher, La Musique, 1737. In fact, this painting is based on a lost work by François Boucher, executed in 1737 and known through an engraving after it by Pierre Aveline that is entitled La Musique (Ananoff and Wildenstein, Boucher, cat. 144). As is evident, all the significant elements in A Couple Making Couple can be traced to this engraving: the amorous couple, the still life of musical instruments, the pine trees, the fountain with sculpted putti, and the pair of sphinx statues. Also, the painting reflects the directional sense of the engraving whereas Boucher’s painting was in the opposite sense (see, for example, the version in the Musée Cognac-Jay; illus. Joulie, , fig.12). Quel magicien que ce Watteau! Quoi de plus pittoresque que cette chanson de la source, qui alterne avec la chante de la viole et avec la voix de l’amoureuse! Cela est évoqué avec tout l’art de l’enchanteur des Fêtes galantes. Cette eau-forte précieuse est de Boucher, qui, plus d’une fois, on le sait, a interprété Watteau avec sa pointe vive et libre. Could any message be so close to the truth and yet hopelessly garbled? Had it proclaimed just Boucher’s name and not intoned Watteau’s, it would almost have been correct. A Couple Making Music could not have been based on the engraving in L’Artiste since the painting includes elements such as the sphinxes that are not in the engraving. But it is possible that the engraving copied the painting. All the motifs seen in the engraving are present in the painting and is cast in a horizontal format like the painting, in contrat to Boucher’s original design which is vertical. 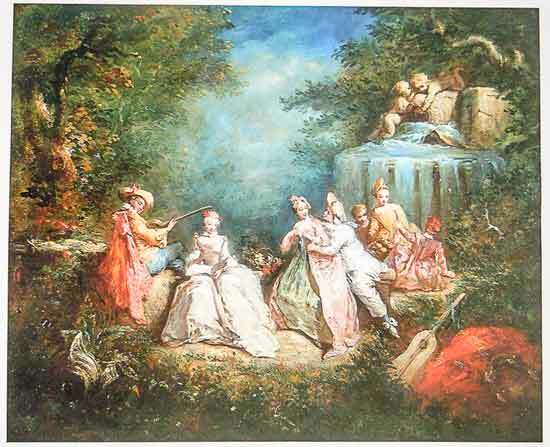 If as we believe, the engraving was based on A Couple Making Music, this helps establish that in 1860 the painting was in Paris or nearby, and that at the time it was misattributed to Watteau. Anonymous artist, Fetes champetres, oil on canvas, 87.7 x 95.7 cm. Whereabouts unknown. 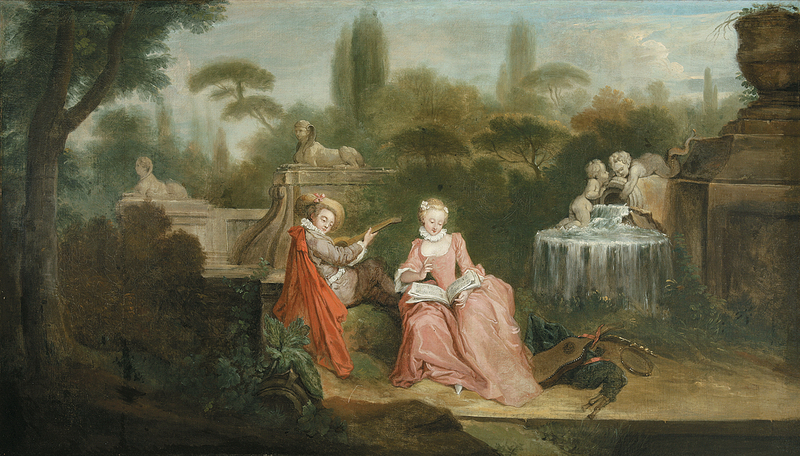 Another variation on Boucher’s invention, known under the title Fetes Champetres, also contains some of the same motifs from Boucher, namely the amorous couple, the fountain with putti, and even the still life of musical instruments in the foreground. This pastiche has additional figures borrowed from Lancret. Judging from photographs, it seems possible that both paintings were executed by the same artist.